Spain’s national football team coach Vicente del Bosque has today released his 23-man squad for the upcoming Euro 2016 tournament in France and it has two surprise omissions in Real Madrid’s Isco and Atletico Madrid’s Saul Niguez. The 23-man list features a host of stars and top talents but coach Vicente del Bosque has been criticized for leaving out two youngsters out of the squad, players who are seen as the future of the Spanish National Team. Both Isco and Saul made the provisional squad but they both have been left out of the final squad with the likes of Lucas Vazquez, David Silva and Pedro Rodriguez preferred over them, something the footballing world got shocked about. Also, Real Madrid defender Dani Carvajal missed out on the Squad through an injury and was replaced by Arsenal right back Hector Bellerin who had a great season. That position will be managed alongside Juanfran. The squad also sees a host of new names leading the line in attack with the likes of Alvaro Morata, Aritz Aduriz and Nolito all featuring in their first major tournaments for La Roja. 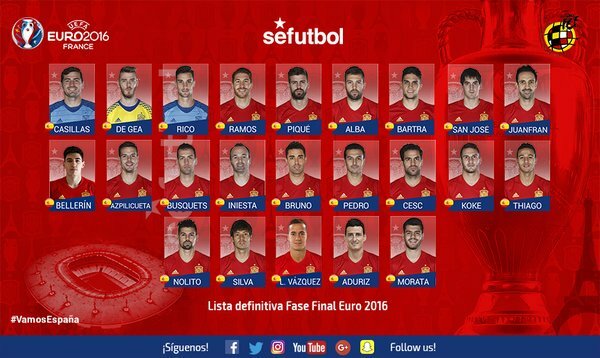 The full Spain squad for Euro 2016: Iker Casillas, David De Gea, Mikel Rico, Gerard Pique, Sergio Ramos, Marc Bartra, Jordi Alba, San Jose, Juanfran, Hector Bellerin, Cesar Azpilicueta, Bruno, Busquets, Andres Iniesta, David Silva, Cesc Fabregas, Koke, Thiago Alcantara, Pedro Rodriguez, Aritz Aduriz, Alvaro Morata, Lucas Vazquez, Nolito.